Tuesday was Ada Lovelace Day, a day when we celebrate women in science and remember the contributions of Augusta Ada Byron, later the Countess of Lovelace, who wrote devised an algorithm for Charles Babbage's analytical engine. 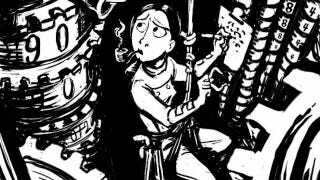 Cartoonist Sydney Padua celebrates Lovelace in her webcomic 2D Goggles, or The Thrilling Adventures of Lovelace and Babbage, imagining an alternate history in which the two early computer scientists team up to fight "crime" in all its forms—economic collapse, vampire poets, and the curious evils of street music. We first mentioned Padua's comic a few years back, but it's grown since then into a deeply funny spin on the history of the Victorian Era. "Lovelace and Babbage vs. The Economy" follows the Panic of 1837, which bears a striking resemblance to a more recent economic crisis. In "Lovelace and Babbage vs. The Client," Queen Victoria asks Babbage his actual least favorite question about his engine. "Lovelace and Babbage vs. The Organist" combines Babbage's hatred of street musicians with Lovelace's theories that the analytical engine could be used to compose music, with bizarre and destructive consequences. "Lovelace and Babbage vs. The Vampire Poets" involves the Brontë sisters and the Countess of Lovelace's Byronic blood. Each installment is heavily footnoted with links to the primary resources on which Padua builds her smart but silly stories. Even if you're not familiar with the historical details of Lovelace and Babbage's life, Lovelace and Babbage works as a loony steampunk adventure. Babbage seizes up his ray gun every time a musical note threatens his concentration, and pipe-smoking Lovelace may roll her eyes, but she'll pick up a pistol and shoot the wallpaper while meditating on the P versus NP problem. And in the "Pocket Universe" of Padua's webcomic, the analytic engine is not only complete; it's enormous, in need of Lovelace's constant attentions. The only thing it and its inventors don't seem capable of is holding to their mission statement: to fight crime. But then again, there are so many non-criminal problems in Victorian England that need solving. The pair's completed adventures are available to read online and through the 2D Goggles iPad app. The webcomic is currently on hiatus, but while we're waiting to see what happens to the Brontës, Padua is working on a longer graphic novel detailing the adventures of this allegedly crime-fighting duo. So on future Ada Lovelace Days, we'll be able to thumb through the alternate history of Miss Ada Lovelace.